Blazing Hot Wok: Can mom just brag a little? Can mom just brag a little? Sonny has finally mastered eating with chopsticks! Okay, maybe mastered is a bit of an exaggeration, but I'm still spectacularly proud of him. It used to be that he'd get food everywhere but in his mouth, which was quite frustrating for him (and me!). Inevitably he'd just give up trying. The turning point came over Christmas. Grandma took us to a Hunan restaurant where we were each given a bowl of rice and a set of chopsticks. Thais and Danes don't normally eat rice with chopsticks, so we were all at a disadvantage, but if the 4-year-old at the table next to us could do it, no reason we couldn't. I thought Sonny would just give up, but he kept stealing glances toward the kid at the next table, trying to mimic his actions. He actually didn't do too bad and managed to pick up some of the bigger pieces of food. He still made a mess with the rice but at least he didn't give up in frustration. Then during a recent visit to a Japanese restaurant, when the waitress gave him a fork, he asked for chopsticks. I thought, Oh, no. This is going to be messy. Only, it wasn't. He was able to pick up his sushi and pieces of tofu. Compared to the Chinese rice, the sticky Japanese rice was cake. He even said as much. If you don't like cold tofu, I won't hold it against you. You may, however, still appreciate the sauce. It goes well with fried tofu, grilled chicken or pork or drizzled over fried eggs. Get yourself a block of "regular" or firm tofu. Press out the water by rigging some kind of draining contraption. For me, this means placing the tofu block in a flat-bottomed colander, putting a sheet of plastic wrap on top of the tofu and then setting my Dutch oven on top of that. Not pretty or sophisticated, but gets the job done. Let the tofu drain for about 45 minutes. This is key for two reasons: 1) you want to press out most of the water to get a nice, compact (yet not-rubbery texture), and 2) letting it sit out of the fridge brings it to the right temperature. Cold tofu is pleasant; really cold tofu is not. While the tofu is draining, make the sauce. Combine an equal amount of tamari and mirin. Add sugar to taste. (Yes, it's basically a teriyaki sauce.) You may choose to add a splash of rice vinegar as well. Throw in some finely sliced green onions and freshly toasted sesame seeds or toasted sesame oil. 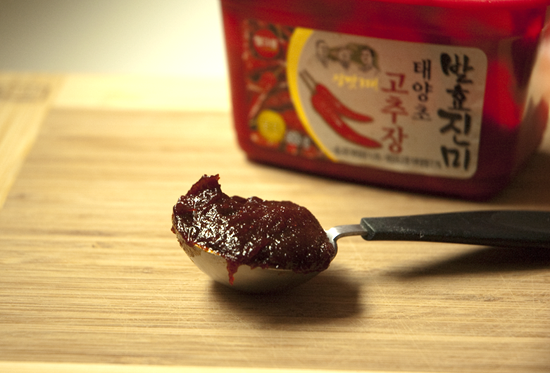 The final ingredient, which was not in the restaurant version since it's not Japanese, is gochujang (Korean red pepper paste). This is probably one of the greatest culinary inventions of all time and it's an understatement when I say I highly recommend it. Use as much of it as you'd like. 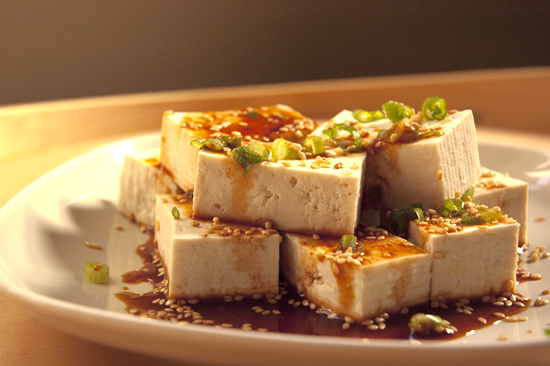 Once the tofu is sufficiently drained, cut it into cubes and serve it with the sauce. It makes a great side dish, or if you want a meal, serve it with a bowl of Japanese rice (white or brown are both great!) and a side salad or lightly pickled cucumber (equal volumes of mirin and rice vinegar, salt to taste).